The easiest and quickest software around for creating your website. 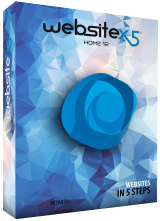 WebSite X5 is the only software, designed to work like a wizard, that lets you create a website in 5 easy steps. Easy and intuitive, WebSite X5 doesn’t require any programming skills and guides you through the steps to create and publish your website on the Internet in no time. FTP engine for publishing your website. Please note: GOTD users who have activated WebSite X5 Home 12 can purchase WebSite X5 Evolution 12 with 50% discount up to the end of 2nd of April 2016: $37.50 instead of $75.00.